When 128 people were killed in terrorist attacks in Paris, millions of people around the world were shaken in a way they simply had not been the day before, when a terrorist attack in Beirut left 43 people dead and more than 200 injured. What happened in Beirut wasn’t the only example of a tragedy that went largely unnoticed—in the days after the Nov. 13 Paris attacks, news organizations, human rights groups, and everyday social media users widely shared a statistic that said the equivalent of one Paris attack has happened every day in Syria for the last five years. This chart might help explain some of the world’s apparent compassion gap. France is by far the most popular international tourist destination, receiving about 84 million visitors from abroad every year, according to the World Tourism Organization. 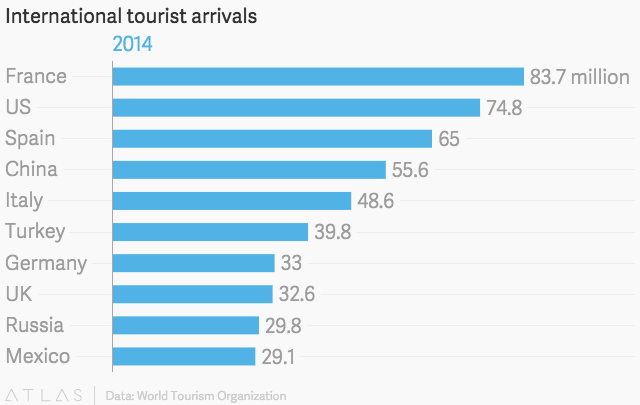 That’s almost 10 million more than the US, the next most popular country for international tourists. Even the briefest of trips can give travelers a sense of personal connection to the countries they’ve visited. And as Quartz’s Bobby Ghosh recently pointed out, having that connection is a perfectly reasonable argument for caring more about some places than others.